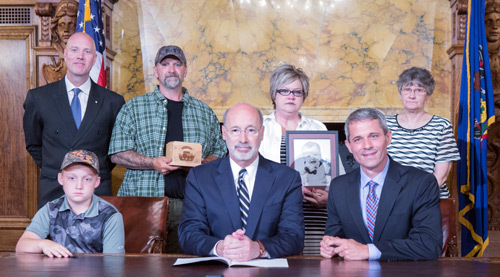 HARRISBURG – Today, the governor signed into law legislation, authored by Rep. Rob Kauffman (R-Franklin), that will place stronger penalties on individuals who endanger children in their care. The legislation was drafted following the tragic death of a young child in Franklin County. The new law will better ensure that parents, guardians or those charged with the care of a child will face harsher penalties in cases of child endangerment if the child is under the age of 6, if the endangerment results in serious injury or death, or if the endangerment is part of a continuing course of conduct. The Franklin County case that was the catalyst for the legislation took place in 2010 when an 11-month-old boy, Heath Ryder, was killed by a 9-year-old girl while in the care of an adult caregiver. The girl was left unsupervised with the infant when the incident occurred. Although the girl was charged and went through the juvenile court system, the adult faced lesser charges, due to limitations in the law at that time. Kauffman’s comments, given at the bill signing, can be viewed here. Currently, a person who endangers the welfare of a child under the age of 18 can be charged with a first-degree misdemeanor, and if the conduct is part of a continuing course of conduct, the offense is graded as a third-degree felony. • An offense will be a third-degree felony if the person’s conduct created a substantial risk of death or serious bodily injury. • An offense will be a second-degree felony if the person’s conduct created a substantial risk of death or serious bodily injury and was part of a course of conduct. • The grading for any offense will be increased one level if the child victim is under the age of 6 at the time of the offense. Act 12 of 2017 will take effect in 60 days. Gov. Tom Wolf signed into law legislation authored by Rep. Rob Kauffman that will place stronger penalties on individuals who endanger children in their care. Joining them for the public bill signing were Franklin County District Attorney Matt Fogal (standing, left); Heath’s parents, Mark and Shelly Ryder (standing, center); Heath’s brother, Aiden (seated at the table); and Heath’s grandmother, Deb Lebeau (standing, right).